Unless literally none of the information we have about upcoming developments in Kindle products turns out to be accurate, there are a couple things we can safely assume. There will definitely be a front-lit Kindle eReader along the lines of the Nook Simple Touch w/ GlowLight, for example. That was inevitable, of course, but thanks to the details of Amazon’s recent contract with the US State Dept we know that it will be sooner rather than later. We also know that there will be a new Kindle Fire tablet of some sort this year. Amazon is said to have originally intended a larger model Kindle Fire to b ready on release day, giving customers some choice. Due to time constraints, and the need to be ready for last year’s holiday season, that didn’t pan out. This year the talk has been about Amazon making good on that potential. We have heard rumors indicating an 8.9” Kindle Fire, a 10.1” Kindle Fire, both at once, and more. The predicted timeline puts whatever happens in the next 4-6 months. The latest update we have on this comes via DigiTimes. As always, they must be taken with some caution. Still, the information seems realistic and they have come up with some early information in the past that turned out accurate. 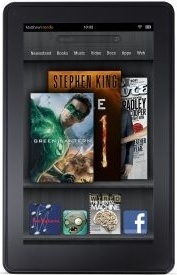 This report indicates that Amazon will be releasing an update to their 7” Kindle Fire in the third quarter of 2012. It will include a higher resolution 1280 by 800 screen as well as other unspecified hardware improvements meant to target higher-end tablet customers. The price of this model will still be just $199. The existing Kindle Fire will continue to be available to customers much as the iPad 2 remains available despite the hardware having moved on. The Kindle Fire Classic, or whatever it is called by this time, will be sold for just $149. This is expected to go a long way toward increasing Amazon’s exposure and overall Android tablet dominance. The same report also goes on to explain that the previously mentioned 10.1” Kindle Fire is still going to be made and appears to be on the way either late in 2012 or early in 2013. Supposed 8.9” device development has been suspended, presumably because three active options in the Kindle Fire line will already be more than enough to choose from. There is no word so far how much this larger tablet will cost. DigiTimes aside, I think that there is enough precedent to say that Amazon will likely have a large sale on the existing Kindle Fire prior to and immediately following the release of its successor. It may be kept around, much as the Kindle Keyboard has been, but more likely the price drop will simply be a transition tool. Amazon has been suspected of selling previous generation devices as “refurbished” regardless of their actual condition in order to drum up some last minute interest and clear out existing inventories. This entry was posted in Amazon, Kindle Fire, Kindle News and tagged digitimes, Kindle Fire 2, Kindle Fire Classic, price drop, rumors by matthew. Bookmark the permalink.